Various page elements output by the theme can be toggled on and off on the theme's configuration page. You can locate these settings at "Administer > Appearance > Settings > themeName". For example, the site's slogan can be suppressed by unchecking the "Site slogan" check box on that page. These checkboxes show themselves depending on the features enabled inside the .info file. It must be specified with the key of 'features' followed by empty brackets then the feature itself, e.g., features = the_feature. If none are defined, the following values are assumed. Drupal 7 removes the previously available mission and search as theme features (they can be created and controlled as blocks instead) and adds a toggle for "User verification status in comments". To disable any features, only add the ones you want into the .info file. Defining only the features needed for the theme will omit the rest. Some of the features will also enable related form fields. For example, 'logo' will enable an upload field for the image along with the checkbox. The contents of the .info file are cached in the database so altering it will not be noticed by Drupal. (Do not confuse this with the theme registry.) To learn how to clear it, check out the options in Clearing the theme cache. hook_features() is no longer supported. In Drupal 6, these settings were located at "Administer > Site building > Themes > themeName"
Drupal 7 also stores a cache of the data in .info files. If you modify any lines in your sub-theme's .info file, you MUST refresh Drupal 7's cache by simply visiting the Appearance page at admin/appearance. Setup the location for your new sub-theme. Copy the STARTERKIT folder out of the zen/ folder and rename it to be your new sub-theme. IMPORTANT: The name of your sub-theme must start with an alphabetic character and can only contain lowercase letters, numbers and underscores. For example, copy the sites/all/themes/zen/STARTERKIT folder and rename it as sites/all/themes/foo. Why? Each theme should reside in its own folder. To make it easier to upgrade Zen, sub-themes should reside in a folder separate from the base theme. Setup the basic information for your sub-theme. In your new sub-theme folder, rename the STARTERKIT.info.txt file to include the name of your new sub-theme and remove the ".txt" extension. Then edit the .info file by editing the name and description field. For example, rename the foo/STARTERKIT.info file to foo/foo.info. Edit the foo.info file and change "name = Zen Sub-theme Starter Kit" to "name = Foo" and "description = Read..." to "description = A Zen sub-theme". Then, visit your site's Appearance page at admin/appearance to refresh Drupal 7's cache of .info file data. Choose your preferred page layout method or grid system. By default your new sub-theme is using a responsive layout. If you want a fixed-width layout for your theme, delete the unneeded responsive-sidebars and responsive-sidebars-rtl css/sass files and edit your sub-theme's .info file and replace the reference to responsive-sidebars.css with fixed-width.css. Alternatively, if you are more familiar with a different CSS layout method, such as GridSetApp or 960.gs, etc., you can replace the "css/layouts/responsive-sidebars.css" line in your .info file with a line pointing at your choice of layout CSS file. Edit your sub-theme to use the proper function names. Edit the template.php and theme-settings.php files in your sub-theme's folder; replace ALL occurrences of "STARTERKIT" with the name of your sub-theme. For example, edit foo/template.php and foo/theme-settings.php and replace every occurrence of "STARTERKIT" with "foo". It is recommended to use a text editing application with search and "replace all" functionality. Set your website's default theme. Log in as an administrator on your Drupal site, go to the Appearance page at admin/appearance and click the "Enable and set default" link next to your new sub-theme. Modify the markup in Zen core's template files. If you decide you want to modify any of the .tpl.php template files in the zen folder, copy them to your sub-theme's folder before making any changes. And then rebuild the theme registry. For example, copy zen/templates/page.tpl.php to foo/templates/page.tpl.php. Modify the markup in Drupal's search form. Copy the search-block-form.tpl.php template file from the modules/search/ folder and place it in your sub-theme's template folder. And then rebuild the theme registry. Why? In Drupal 7 theming, if you want to modify a template included by a module, you should copy the template file from the module's directory to your sub-theme's template directory and then rebuild the theme registry. See the Drupal 7 Theme Guide for more info. 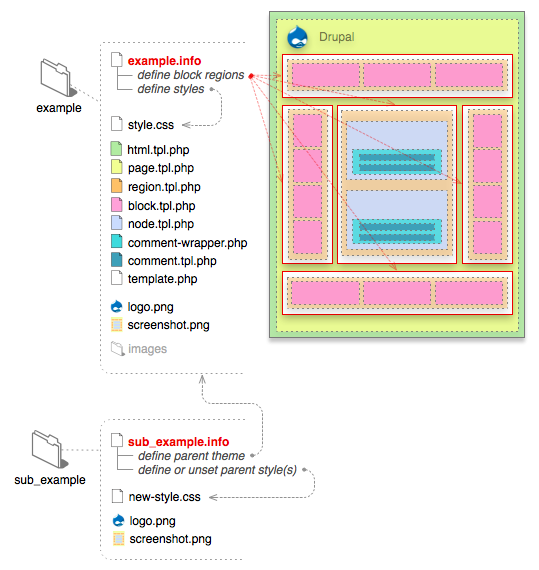 Discover further ways to extend your sub-theme by reading Zen's documentation and Drupal 7's Theme Guide. The .info file is a static text file for configuring a theme. Each line in the .info file is a key-value pair with the key on the left and the value on the right, with an "equals sign" between them (example: key = value). Semicolons are used to comment out a line. Some keys use a special syntax with square brackets for building a list of associated values, referred to as an "array". If you are unfamiliar with arrays, have a look at the default .info files that come with Drupal and read the explanations of the examples that follow. Even though the .info file extension is not natively opened by an Application, you can use TextEdit on a Mac or Notepad on a Windows computer in order to view, edit, and save your changes. 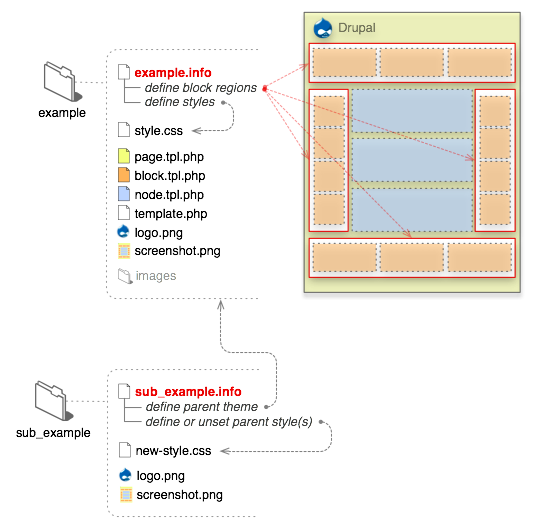 Note that this page describes .info files used for Drupal themes, and not modules. For information about the structure of .info files for Drupal modules, see Writing .info files in the Module developer's guide. The name should start with an alphabetic character, can contain numbers and underscores, but not hyphens, spaces or punctuation. The name will be used by Drupal in forming various functions in PHP and therefore it has the same limitations. Warning! Do not choose the same name as a module, as all installed components must have unique names. For locally created themes using a prefix that is likely to be unique is good for theme naming. A site example.com might call its themes ex_themename. Because the .info file is cached, you must clear the cache before any changes are displayed in your site. The .info file can also specify which theme settings should be accessed from the Drupal administration interface, as you will soon see. The file must be saved as UTF-8 without a Byte Order Mark (BOM). Drupal understands the keys listed below. Drupal will use default values for the optional keys not present in the .info file. See the examples set for core themes. The human readable name can now be set independently from the internal "machine" readable name. This imposes fewer restrictions on the allowed characters. A short description of the theme. This description is displayed on the theme select page at "Administer > Site building > themes". description = Tableless multi-column theme designed for blogs. 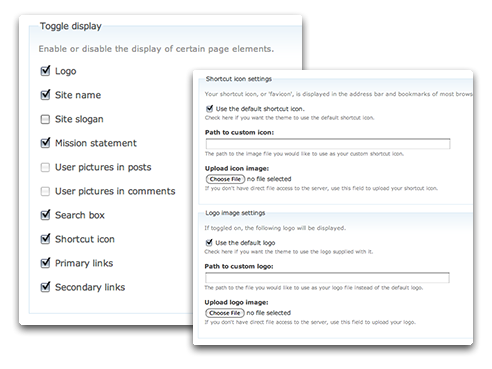 The optional screenshot key tells Drupal where to find the theme's thumbnail image, used on the theme selection page (admin/build/themes). If this key is omitted from the .info file, Drupal uses the "screenshot.png" file in the theme's directory. Use this key only if your thumbnail file is not called "screenshot.png" or if you want to place it in a directory outside of your theme's base directory (e.g. screenshot = images/screenshot.png). More details on creating a screenshot for the administration page. The version string will automatically be added by drupal.org when a release is created and a tarball packaged. So you may omit this value for contributed themes. However, if your theme is not being hosted on the drupal.org infrastructure, you can give your theme whatever version string makes sense. From 6.x onward, all .info files for modules and themes must indicate what major version of Drupal core they are compatible with. The value set here is compared with the DRUPAL_CORE_COMPATIBILITY constant. If it does not match, the theme will be disabled. The drupal.org packaging script automatically sets this value based on the Drupal core compatibility setting on each release node. So people downloading packaged themes from drupal.org will always get the right thing. However, for sites that deploy Drupal directly from git, it helps if you commit this change to the .info file for your theme. This is also a good way to indicate to users of each theme what version of core the HEAD of git is compatible with at any given time. The theme engine, which is used by the theme. If none is provided, the theme is assumed to be stand alone, i.e., implemented with a ".theme" file. Most themes should use "phptemplate" as the default engine. Note that in Drupal 7, this line is no longer necessary because PHPTemplate is assumed by default. PHPTemplate's job is to discover theme functions and templates for the behavior of the theme. Omit this entry only if you know what you are doing. Sub-themes can declare a base theme. This allows for theme inheritance, meaning the resources from the "base theme" will cascade and be reused inside the sub-theme. Sub-themes can declare other sub-themes as their base, allowing multiple levels of inheritance. Use the internal "machine" readable name of the base theme. The following is used in Minnelli, the sub-theme of Garland. More details are available on the page Sub-themes, their structure and inheritance. The block regions available to the theme are defined by specifying the key of 'regions' followed by the internal "machine" readable name in square brackets and the human readable name as the value, e.g., regions[theRegion] = The region name. If no regions are defined, the following values are assumed. You can override the values for your specific needs. If you override regions in D7, you are obliged to declare the line regions[content] = Content. If you want any of the default regions in your theme, you have to declare them as well. More details are available on the page Blocks, content and their regions. Various page elements output by the theme can be toggled on and off on the theme's configuration page. 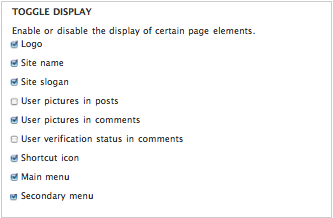 The "features" keys control which of these check boxes display on the theme's configuration page. This is useful for suppressing check boxes for elements not defined or used by a theme. To suppress a check box, omit the entry for it. However, if none are defined, all the check boxes will display due to the assumed defaults. The example below lists all the available elements controlled by the features key. By commenting out the primary_links and secondary_links elements, their check boxes are suppressed and are not seen by site administrators. ; above defaults with only the needed features. More details are available on the page Custom theme settings. Traditionally, themes default to using style.css automatically and could add additional stylesheets by calling drupal_add_css() in their template.php file. Starting in Drupal 6, themes can also add style sheets through their .info file. Starting in Drupal 7, themes no longer default to using style.css if it is not specified in the .info file. More details are available in the style sheets section. This defines the minimum PHP version the theme will support. The default value is derived from the DRUPAL_MINIMUM_PHP constant, which is the minimum required version for the rest of core. This can be redefined for a newer version if needed. For most themes, this should not be added. Note that everything from the line "; Information added by drupal.org packaging script on 2008-02-13" and down is added by the drupal.org packaging script. You should never manually add the project and datestamp keys. The version key added manually (in the first section) allows sites to use your theme when taken directly from git. The following are the assumed defaults. When they are not defined, the theme will automatically take these values. Note: These defaults apply as a group. In other words, overriding a region with regions[sub_header] = Sub-header will omit the rest of the default regions. To gain them back, they must be redefined. This also applies to stylesheets. Even though it's not technically in a group, defining another stylesheet will prevent "style.css" from being included unless it is redefined. DRUPAL_MINIMUM_PHP is a constant. It points to the minimum requirements for Drupal core to run.